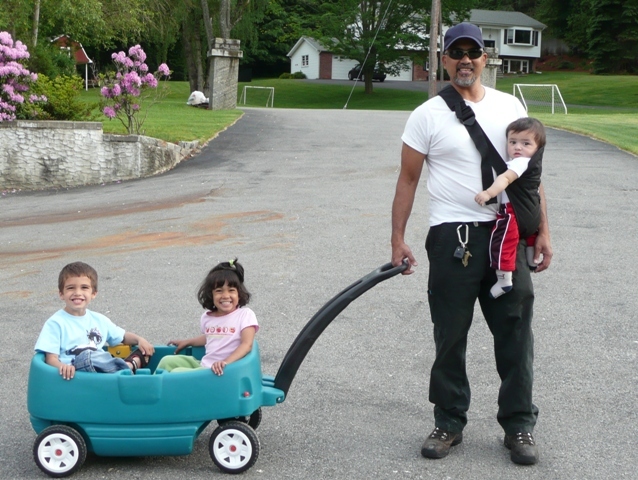 I am so blessed to have a husband that is willing to take the kids out for a walk so mommy can get some work done. I love it! Fantastic photograph! You have a lovely family! Happy WW! .-= Jennifer´s last blog ..A Bath? Wordful & Wordless Wednesday =-. .-= joaofalltrades´s last blog ..Sisterly Love on Chick Chat =-. LOVE the picture! You are so blessed! Hope you relaxed while hubby was walking the lil ones 😉 Oh wait! Was it you who took the picture? Looking forward to meeting both you & hubby real soon! You’re the best! .-= Sharnese LaNier´s last blog ..Walmart Cruise Giveaway Winners =-. Great photo! It touches my heart to see when hubby’s help us out with the kids. I love when my hubby spend some time alone with his boys. .-= Felicia – I Complete Me´s last blog ..Distance: Therapy For The Soul =-. .-= Brandy´s last blog ..I Love A Good Birthday Party =-. Too cute!! Glad he gave you a break, hope you got some work done!! .-= Lorie Shewbridge´s last blog ..Jamar Labs Prize Package Giveaway – Ends 8/7/09 =-. Can you teach my husband to do this please?!?! He thinks his days off are for doing nothing lol! Great picture and what a beautiful family! .-= cassidy engle´s last blog ..Wordless Wednesday! =-. That is awesome. What a prize! Cherish him and give God lots of praise. I’m blessed with a wonderful husband too but many ladies out there are not. Rejoice in God’s blessing! .-= Fruitfulvine2´s last blog ..Recipe for Hot Cocoa – Dominican Style =-.